I have run into this idea on Pinterest several times. Every time I saw it, I thought that it was a good idea, but I never did anything about it. With the move coming up soon, I've finally done it. 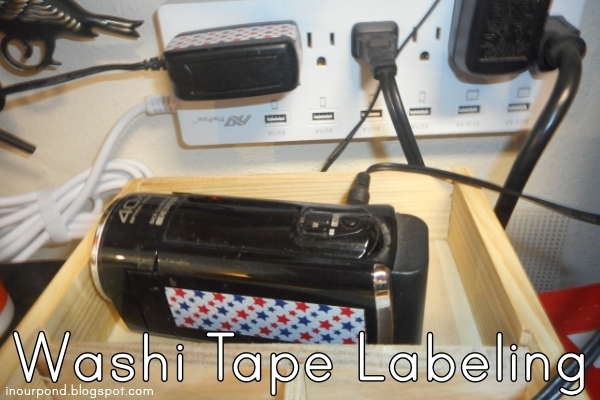 It was so simple to organize my cords with washi tape. I taped charge cords, electronics, and wall chargers with matching tape. It look me probably 20 minutes to round up the majority of our devices and cords and tape them. I really wish I had done it earlier. The cheerful tape patterns make me smile every time I look at them and the tape means that finding a charge cord is now a 15 second problem instead of a constant headache. The power strip I am featuring in my post is one of my favorite things in our house. It has both regular electric plugs and USB plugs. Someday, I'd like to add the USB wall outlets, but this power strip is working very well in our rental house. You can find it for purchase on Amazon. I hope to do a few more organizational posts in the next few months. Keep checking back.